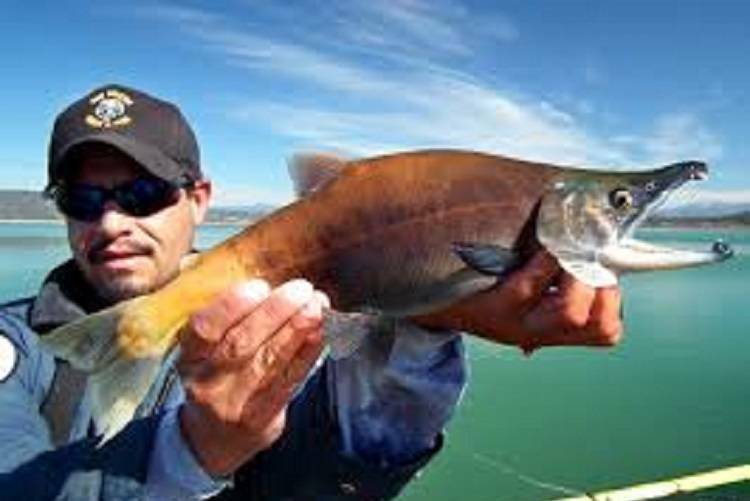 The Navajo Lake kokanee salmon season runs from October 1 to December 31. It's no secret that anglers from across the world visit Navajo Lake State Park every year for the world-class fly-fishing found along the San Juan River at the base of Navajo Dam. But did you know that outdoorsman flock to Navajo Lake every fall for the special kokanee salmon snagging season? Salmon snagging season is October 1 to December 31 at Navajo Lake, and because of the generous bag limit, salmon lovers rarely miss a season. Kokanee are land-locked sockeye salmon. While not native to the Southwest, kokanee salmon thrive in deep and cold lakes like Navajo Lake. Each fall large schools of adult kokanee gather to spawn along the shoreline of Navajo Lake. The bag limit is 12 kokanee per day, with 24 in possession. Snagging at Navajo Lake is only permited during the special kokanee salmon snagging season. Visit the New Mexico Game and Fish for more information and state licensing. At times, New Mexico State Parks will close specific areas on the lake, to fishing and salmon snagging during the month of October so that the New Mexico Department of Game and Fish may harvest salmon eggs. These closed areas typically open to anglers early in November. Remember that fishing is not allowed within 150 feet of boat ramps, walkways or any other infrastructure at any time. If you would like an updated report on the kokanee salmon conditions at Navajo Lake, contact the friendly staff at Navajo Lake Marina (505) 632-3245 or 800-582-5687.